Le Cordon Bleu-trained Katrina Markoff clearly demonstrates her mastery of the art of chocolate, along with skillful use of creativity and mischievousness, through Vosges Haut-Chocolat, a Chicago-based chocolatier with a storefront just down the street from DePaul University's Lincoln Park campus. Although the line has since expanded to include moderately-affordable chocolate bars, when I first started graduate school in 2004, their truffle collections, hand-made marshmallows, and exotic caramels were beyond the reach of my student loan/stipend-based budget. Nevertheless, for special occasions such as a thesis defense, successful completion of my graduate program's horrific comprehensive examinations, etc., I would treat myself to a select-your-own 9-piece violet box of chocolate heaven. Over the years, I grew to eagerly anticipate the smooth feel of the truffle between my thumb and forefinger, the tiny ping of the shell cracking beneath the weight of my teeth, and the slow drop into another world as my senses became aware of flavors and textures such as sweet Indian curry powder and coconut in milk chocolate (the Naga®), Guajillo and pasilla chiles plus pepitas in 75% Tanzanian dark chocolate (the Oaxaca), ginger, wasabi, and black sesame seeds in dark chocolate (the Black Pearl®), and, to my surprise, extra virgin olive oil and green olives in white chocolate (the Olio d'Oliva). My favorite, not pictured here (because I ate it) was the Rooster: Taleggio cheese, organic walnuts, and Tahitian vanilla bean in bittersweet dark chocolate. 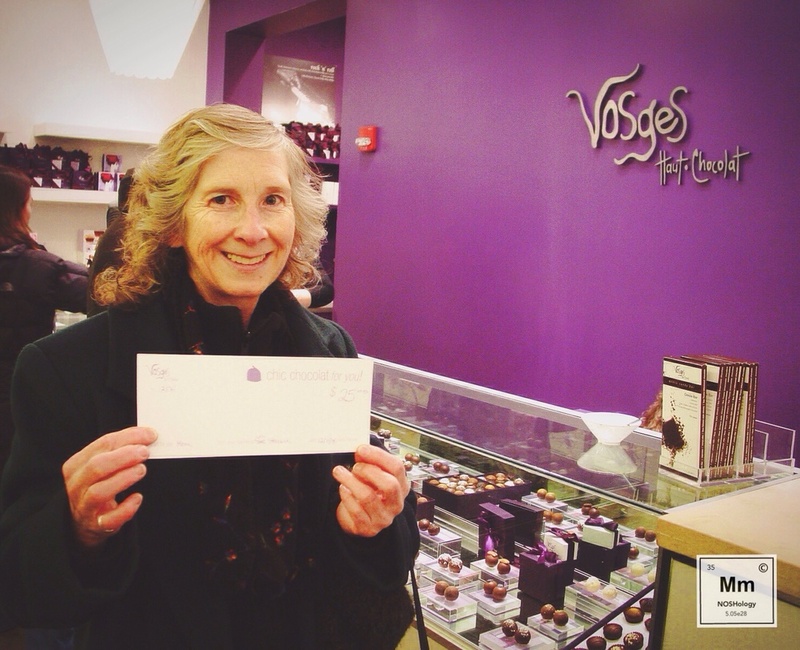 Even my own mother, a diehard devotee of See's Candies, was powerless against the forces of Vosges. If you thought her smile was big holding this gift certificate (given to her during a blustery Chicago Christmas visit), you should have seen it after she cashed it in for some truffles. Okay...it was exactly the same size, but that's because she has a very tiny mouth, a fact which she will be happy to tell you more about should you run into her sometime. 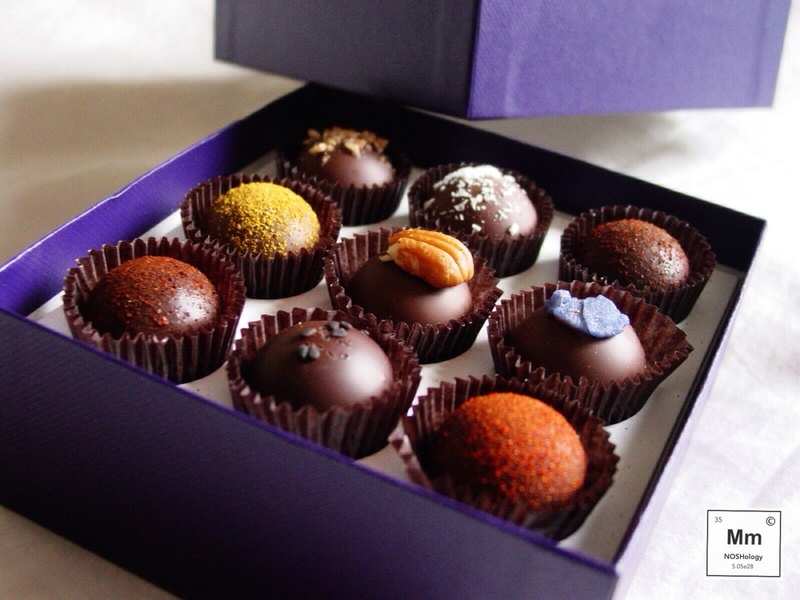 My favorite Vosges Haut-Chocolat store is located at 951 Armitage Ave in Chicago, Illinois.